You get to decide when it’s time to let go of what doesn’t feel good in order to enjoy all that does. I had the opportunity to experience my first hot air balloon ride. Unlike skydiving — which is exhilarating beyond measure — I found hot air ballooning to provide a level of peace and tranquility I never imagined possible. 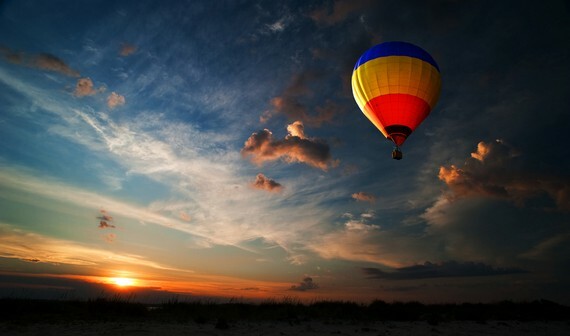 Floating through the sky at an elevation of 5,000 feet in nothing but a basket attached to a nylon and polyester balloon — doesn’t exactly paint the picture of calm. Yet everything about it was serene. The air was smooth as the sweet sound of silence and spectacular Arizona desert views unfolded around us. The reason I share this experience isn’t to advocate hot air ballooning (but if it’s on your bucket list my vote is to do it!). My intention is to share an epiphany I had while drifting through the sky. A very wise friend once gave me some great advice on letting go. She said to close my eyes and place a hurtful situation I was experiencing into a red balloon and release it into the air. At the time I tried to visualize doing just that, but it didn’t evoke great feelings of relief. It was hard to imagine how sending something off into the sky was a peaceful act. It felt spiteful and immature to banish my pain-filled balloon into the clouds. It didn’t feel like a genuine way to truly let go. I didn’t yet understand the value in letting go. The act of letting something go can be done in a loving way. If you are ready to wrap your hurt in a red balloon and let it go, know that where you are releasing it is filled with immeasurable beauty and awe. Imagine that kind of peace extinguishing the hurt and liberating your soul. Every situation, positive and negative, is attached to a lesson. Rather than dwelling on the hurt, shine some light on the lesson. Find gratitude for the hidden gifts within the learning. When you come across people or situations that provide challenging and uncomfortable lessons — know you can let those people or situations go, while still holding onto the valuable insights you were blessed to learn. It is okay to let things go. It is okay, it is okay, it is okay. Holding on to what continually causes us pain will provide more of the same — until we choose differently. Letting go of old ways of thinking opens us up to limitless possibilities for new and exciting ways to experience life. Above all else, know to your very core you are worthy of experiencing the joy and lightness on the other side of letting go. Remind yourself that you are the one who decides whether or not you release what’s holding you back from your joy. One of the most amazing truths about life is that IF we are here right now in this very moment, we are so blessed! Focus on that and in an instant it becomes easier to let go of everything else. You get to decide when it’s time to let go of what doesn’t feel good in order to enjoy all that does. Give it a try and see what happens when you let go.